Ultra-Orthodox Jewish men and women who choose to leave their communities of origin embark on a journey of self-determination utterly alone. They face opposition from every member of their support system, and the challenges they face are enormous. During this journey, many turn to Footsteps, a non-profit organization in New York City, for assistance, concrete support, and a sense of community. Come hear about their work through the firsthand account of Shulem Deen, who himself grew up in the Hasidic Skver community — a very isolated Hasidic enclave — and made the transition into the secular world. 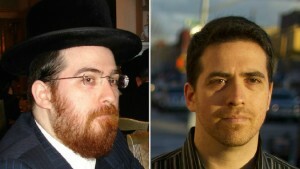 Shulem is the author of All Who Go Do Not Return, and a Footsteps member and board member. He will be joined by Lani Santo, Executive Director of Footsteps.